Kalambaka, the village located at the foot of Meteora, is approximately 220 mi. [350 km.] 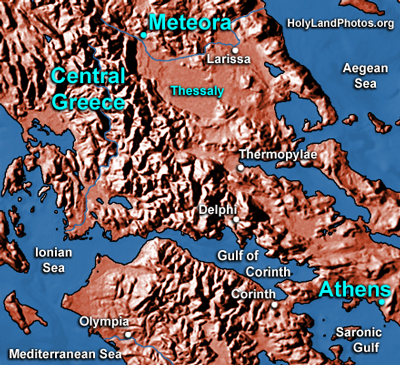 northwest of Athens. Meteora means, "suspended in the air." In the area there are over 60 tall isolated geological formations—some of which have Greek Orthodox monasteries built on them. Hermits first settled the area in the 5th century A.D. and it was in the 14th century that St. Athanasius established the first monastery on one of these tall sandstone outcrops. Eventually there were 24 monasteries although today there are only 5 of them plus one convent.